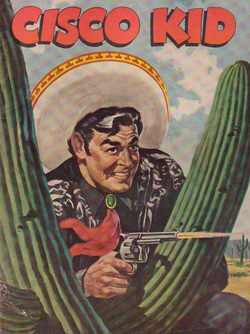 The Mexican "Robin Hood," the Cisco Kid and his rotund sidekick "Pancho" (played by Mel Blanc) rode through the Southwest robbing from the rich, and giving to the poor. A great deal of care and spirit in recreating a true Mexican flavor in the show. The Cisco Kid and Pancho are a wonderful pair of rough and ready vagabonds who often are mistaken for outlaws themselves. They are smart enough to use this to their advantage, and get in and out of trouble at the drop of a sombrero. 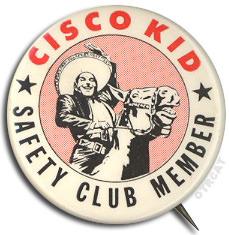 They had trusty steeds that any young cowhand could name - for Cisco, it was Diablo, and Pancho rode Loco. And often, the pair seemed like a couple of crazy devils themselves. Pancho is one of the best sidekicks in Western OTR, as he is always rattling on with a sense of humor that is as wide as his belly. He's a lover of the food, while Cisco is obviously a handsome, dashing hero who has an eye for a shady "varmint", or the fair lady in distress that usually thanks him at the end of the episode. 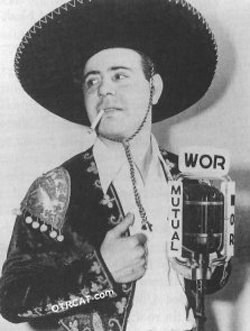 From '42 to '45, Jackson Beck played Cisco Kid, and Louis Sorin handled Pancho. 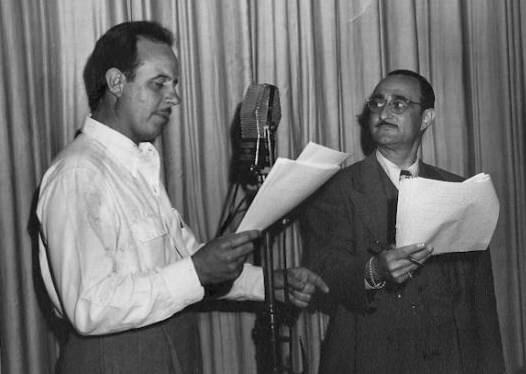 Mutual-Don Lee productions took over in '46, and Jack Mather became Cisco, and Harry Lang played Pancho. They continued in the roles until the show's end in 1959. Tailblazing success in radio made many cowboys ride in shows aimed mainly for kids. With bad hombres that snarled a little harder, and fistfights that were sound choreographed to last longer and be a little more violent than the Masked Man's. The western series that came after the Masked Man's fame used the best of him, and found their own ways of heightening the excitement. Not that The Cisco Kid has anything like the realism of Gunsmoke, Have Gun Will Travelor Tales of the Texas Rangers -The Cisco Kid is similar in sound and feel to Wld Bill Hickok, two more popular cowboy series of the same years. None of them sang like Roy Rogers Gene Autry. The sound effects, which are mainly hoofbeats, gunshots and ughs and grunts of scuffles, are perfect. See also: Tales from the Diamond K, Tennessee Jed, and Roy Rogers. For western adventure, there are a bunch, including Gunsmoke, Have Gun Will Travel, Frontier Gentleman, and Six Shooter. This is just to let you know that my order for GUNSMOKE, CISCO KID and THAT MAN HAMMER has arrived safely and expeditiously in Singapore half a world away. Thank you or your prompt and courteous service with all the attention to details. Shopping with you guys is a real pleasure.